tres beau bateau et tres bon concept, a se demander pourquoi les australiens sont aller cherchers des bateaux jusqu'en Europe si dans le coin des chantiers sont capables de faire des bateaux comme ca. juste un truc, comme ca, rapidement, qui m'a etonner. les arbres d'helice sont sur le meme axe que les gouvernails, ca implique que lors d'une operation de maintenance (bon, ca n'arrive pas souvent) neccessitant le demontage des arbres d'helice, il faut alors egalement demonter les gouvernails. bon, comme dit, a n'arrive pas souvent. sinon, le navire a un radier, ou c'est juste une cale de debarquement ? sacre prise au vent !! Le second OPV, le HMNZS Wellington a été lancé le 27 octobre 2007 à Williamstown. HAWEA, the second of the four Inshore Patrol Vessels being built entirely in New Zealand by Tenix in Whangarei, was launched in Whangarei Harbour on Tuesday 11 December. This is another significant step in the introduction into the Navy of seven new ships under Project Protector. The first ship, the multi-role vessel HMNZS CANTERBURY, was commissioned into the Navy in June this year. 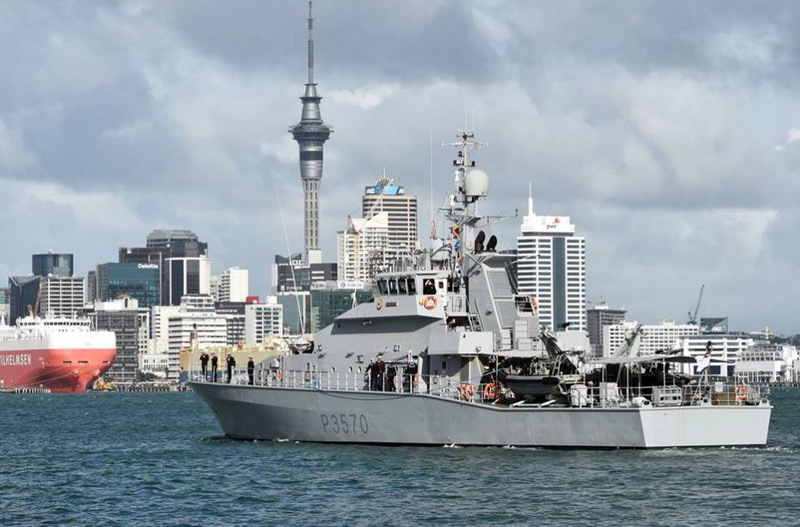 The first Offshore Patrol Vessel, OTAGO, was launched in Williamstown in November 2006 and more recently, the second Offshore Patrol Vessel WELLINGTON was launched in Williamstown in October this year. Last week, HAWEA’s sister ship, the first Inshore Patrol Vessel, ROTOITI, successfully completed her sea trials in the Whangarei Harbour areas. She was launched in late July this year and was named a week later at the Tenix Shipyard in Whangarei. By the end of 2008, the Navy’s Protector Fleet will comprise of seven ships of three different classes; one Multi Role Vessel (MRV), two Offshore Patrol Vessels (OPV) and four Inshore Patrol Vessels (IPV). HAWEA will have her naming ceremony on Saturday, 15 December commencing at 12:30 pm. Launch Lady, Lady Sandra O’Regan, will name the ship and bless all her sail in her before the champagne bottle smashes onto the bow and the second Inshore Patrol Craft is one step closer to her delivery date. Tenix will commence the ship fit-out and HAWEA is scheduled to be officially handed over to the Navy in mid 2008. “The naming ceremony for the new Inshore Patrol Vessel HAWEA is yet another significant milestone in Project Protector. HAWEA is the second of the four Inshore Patrol Vessels to be launched and the third ship of the name to serve in the RNZN. The first was a LOCH Class frigate that, among other things, saw operational service in Korea. The second was the Lake Class patrol vessel that carried out some of the important multi-agency tasks on which the latest HAWEA will be focussed - including activities in support of the Ministry of Fisheries, the Department of Conservation and the Customs Department." HAWEA is affiliated to the Westport/Greymouth region and will be under the command of Lieutenant Grant Judson (Tauranga). Executive Officer is Sub Lieutenant Damian Gibbs (Whangarei). Et hop ! on ravive un fil de discussion abandonné sans rien à manger depuis des lustres ! Le lundi 21 mai 2018, le patrouilleur côtier néo-zélandais TAUPO (P3570, classe PROTECTOR) a quitté Auckland pour rallier l’archipel des Fidji où, pendant trois mois, il va aider la marine des îles Fidji à surveiller sa Zone Économique Exclusive de 1 100 000 km². Il contribuera aussi à la formation des marins fidjiens. Deux officiers des pêches néo-zélandais sont à bord ; ils ont pour mission de former leurs homologues fidjiens. Des marins fidjiens embarqueront également pour bénéficier d’une formation. C’est la deuxième année consécutive que la Nouvelle-Zélande aide ainsi l’archipel. L’année dernière, la campagne de surveillance avait été très fructueuse : 550 navires contrôlés, 110 infractions au code fidjien de la pêche constatées, 50 marins fidjiens, 27 officiers des douanes et 19 officiers des pêches formés.